Quiche recipes have become something I rely on anytime I want my kids to eat eggs because this is the ONLY way they’l eat them. Fortunately, for me, making a quiche is also a perfect opportunity to create a low Points breakfast that I can also enjoy. 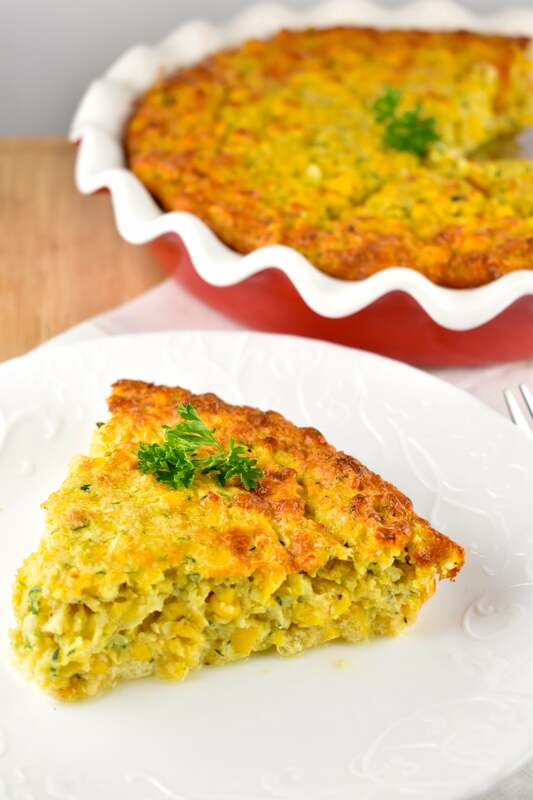 This Corn and Zucchini Quiche Recipe is one of the best vegetarian quiche recipes I’ve ever tried. That’s right folks – no bacon, ham, or sausage needed to make this an amazingly delicious, mouthwatering meal. The sweet corn is really the star of this dish. 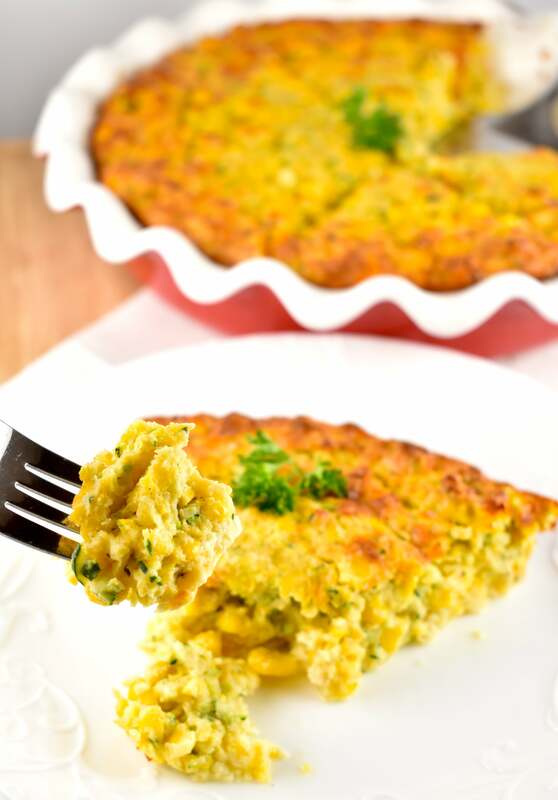 By blending it a bit with the immersion blender, the texture of the quiche becomes this wonderful, velvety blend that doesn’t taste too “eggy”. I added some fresh summer zucchini which gives it a lovely pop of color, and a nice fiber boost. And, I love finding ways to slip in more vegetables anytime I can. No crust needed here, as the flavor of the quiche itself is so divine, a crust isn’t necessary. Of course, you can always use one, if you’d like. But to keep the Points low, I always make it without. And once you taste it, I’m sure you’ll also agree that there’s really no need for it. 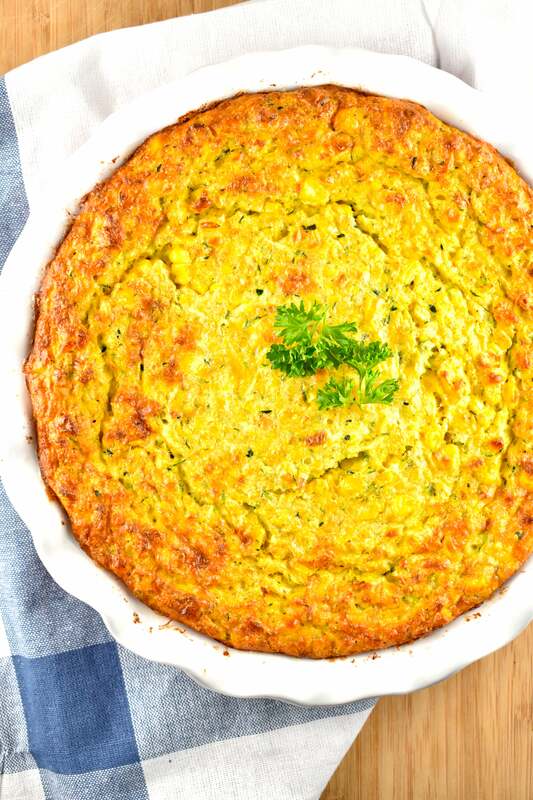 Believe it or not, I got the idea for this delicious, crustless corn quiche recipe from one of my son’s preschool teachers. The teachers had helped the kids make this one day for their afternoon snack, and when I came to pick up my son, he was still sitting at the table gobbling his down. One of his teachers, Ms. Sylvia, told me that he LOVED it. And it was pretty clear that was true. So, I was excited to recreate it for him at home, and figured I could transform it into a Weight Watchers friendly quiche too! So Ms. Sylvia told me what was in it, and I went to work putting it all together later that week. It turned out absolutely perfect, and incredibly delicious. Thank you, Ms. Sylvia! Your quiche was a hit! 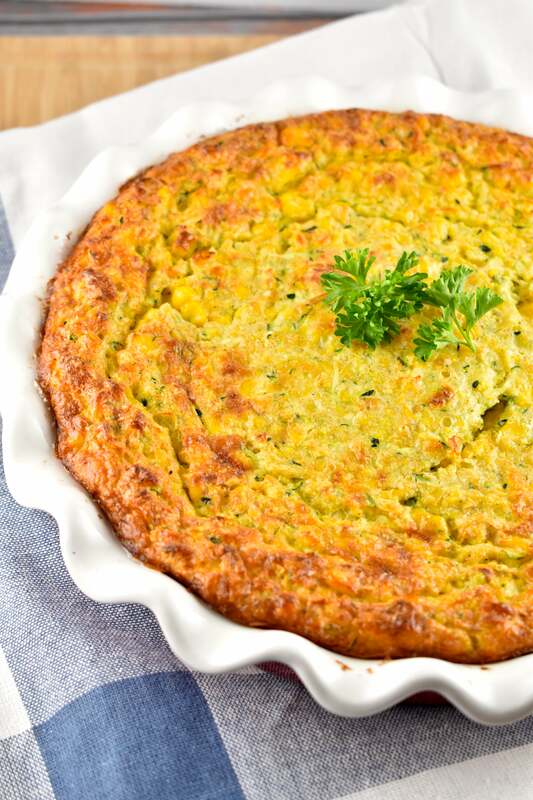 Creamy, sweet and comforting, this simple corn and zucchini quiche was a total hit. 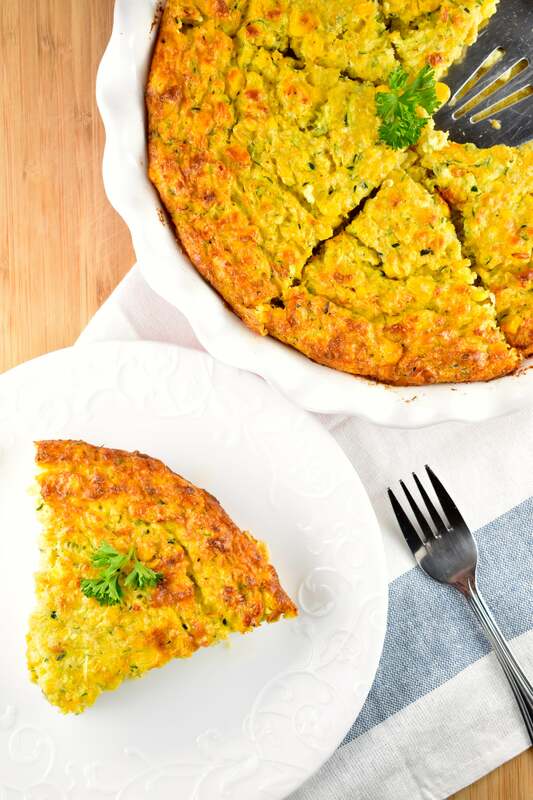 Serve it for breakfast, brunch or dinner and enjoy without feeling an ounce of guilt. Preheat oven to 375 degrees. Spray a pie pan or baking dish with nonfat cooking spray. 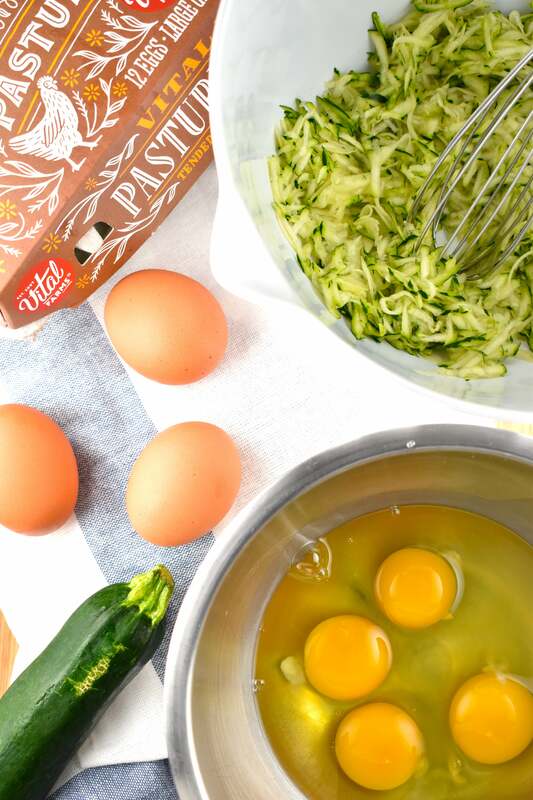 In a small bowl, whisk together eggs, milk, and salt and pepper. 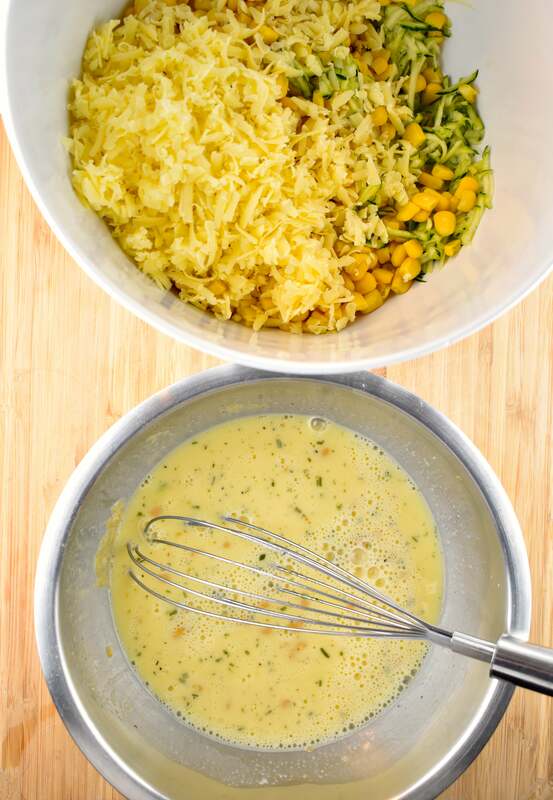 In a separate bowl, combine the remaining ingredients. 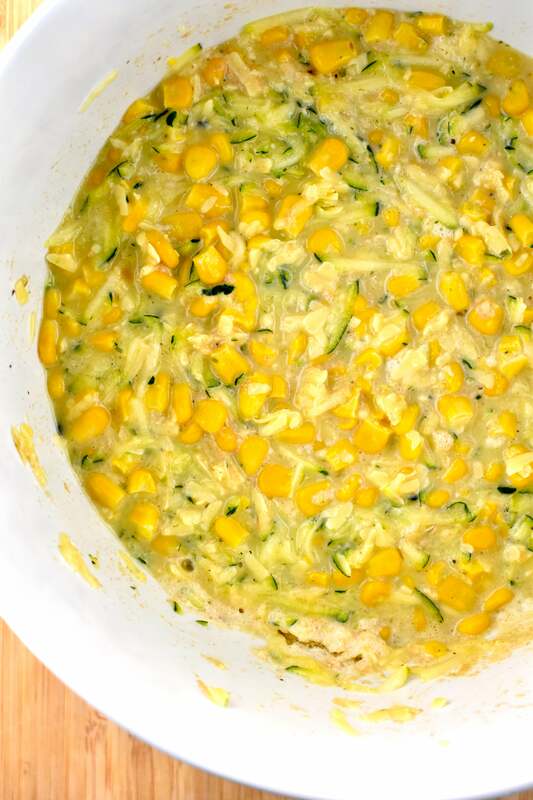 Pour the whisked egg mixture into the corn and zucchini mixture and stir to combine. 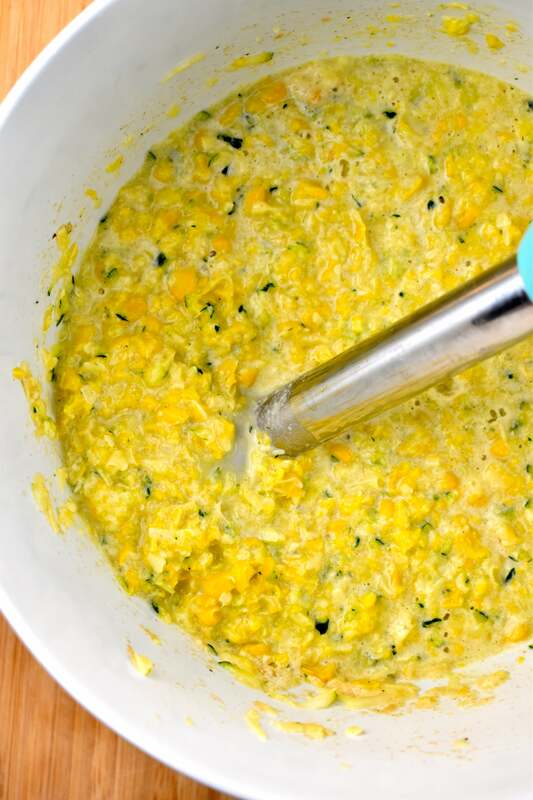 Using an immersion blender, process the quiche mixture until mist of the corn kernels are broken down, but leaving some whole. Pour into prepared dish. Place in oven and bake for 35-40 minutes or until a knife inserted near the center comes out clean. Let stand for 10 minutes before serving. Cut into 6 slices. I didn’t have corn, so I substituted hominy. Wow! Hands down the best Quiche ever! 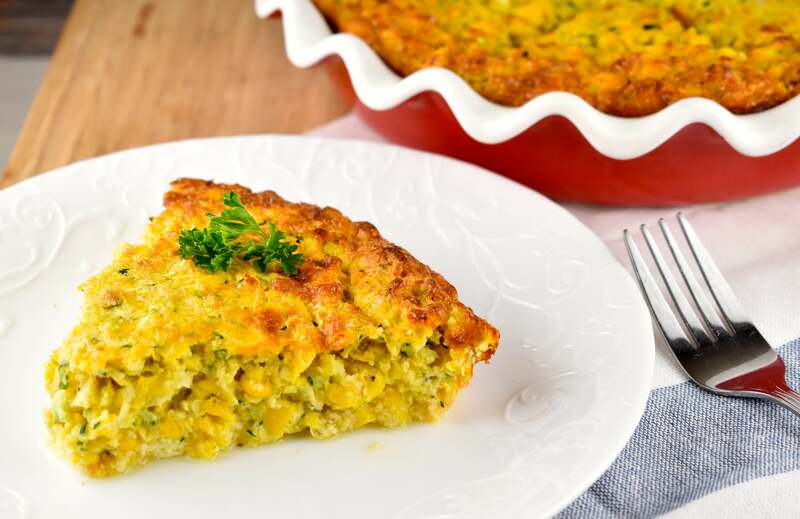 Do you think you could substitute corn meal for whole wheat flour? I haven’t tried it myself, but I think it should work just fine as a substitute. I just started back on WW, and this sounds soo yummy. This looks delicious! I’ve never maid a quiche and wondering if I can add fresh spinach? This sounds like the corn pudding my mom used to make for the holidays. It was always my favorite. Hi there! Since I’m starting to see sweet corn on the cob in stores now, I might consider making this with fresh corn instead of canned. How much would you recommend? I’m never sure about the drained volume of canned stuff. Would it be about a cup and a half? Two cups? This looks super-tasty, and I’m really eager to give it a try, maybe with some roasted jalapeños added! Yes, about 2 cups of fresh corn.